Estimating total grazeable land in an operation is key for sustainable management. 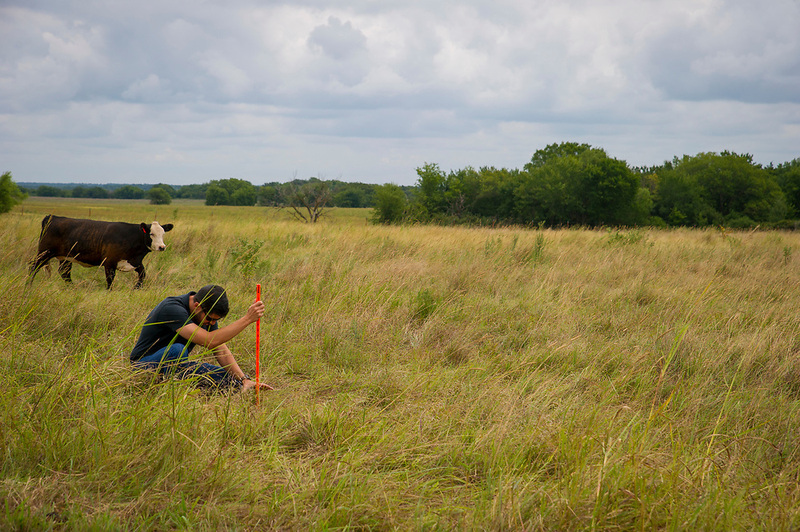 However, on-site measurements of grassland area among woodlands, water sources, and buildings can be a slow, laborious, and costly process. Thankfully, new online tools available to the public can facilitate this process. Google Earth is a geographic browser that uses satellite imagery, aerial photography, and geographic information systems to represent Earth as a 3D globe. Assessing forage production is key for developing a successful livestock operation. Proper formulas using available forage as input are necessary to determine the animal herd that a specific operation can support without overstocking or understocking pastures. Even though the best forage production estimation is done by on-site measurements and observations, producers are now able to estimate the potential forage productivity of their land prior to any on-site assessment. Rangelands in Oklahoma vary widely in their topography, rainfall, soils and plant communities. Because of these differences, management that is effective in one area often does not have the same outcome in another area. There are two on-line resources that can help in making site-specific management decisions on rangelands: the Web Soil Survey and the Ecological Site Information System. Rangelands are complex systems to understand and to manage. Luckily there are tools available to aid in making management decisions such as setting initial stocking rates, identifying the current state of the site, and determining past management practices, as well as the potential of a site. The Web Soil Survey and Ecological Site Descriptions are two such tools where land managers, consultants and Extension educators can get site specific information even prior to visiting a particular location. This fact sheet provides detailed instructions for navigating the Web Soil Survey system. The amount of forage produced in pastures changes each year mostly due to rainfall and temperature fluctuations. Hot and dry years tend to have less forage production than wet and temperate years. Most of the time, the changes in forage production are not considered in the grazing management and the herd size is kept constant rather than adjusted to match the amount of produced forage. This circular is designed to help producers with the complex fertilization questions they face, and it is unique in that it covers simple management practices in addition to a range of complex interactions related to forage and pasture fertility. The primary end-point is that this guide simplifies the complexity into practical situations that can be used by producers. This publication is designed to support forage and livestock producers, Extension educators, and Certified Crop Advisers in effective, profitable and environmentally-sound management decisions regarding forage and pasture fertility practices. It is not a replacement for good management; rather, it is the road map to help good managers get even better. CR-2598 Johnsongrass in Pastures: Weed or Forage?